If you are spending only a night in Paris, head to “Paris Most Beautiful Avenue” and have a moonlit walk along the Seine River‘s banks. On your way, you will see some of the main Paris tourist sights, from Notre Dame Paris to Les Invalides, this time beautifully illuminated. It is difficult not to be in love with Paris after a night stroll like this one! OUR TIP: If after a full day doing the tourist you are too tired to walk you can always enjoy the same panorama with a Paris night cruise, cocktail in hand. Les Bateaux Mouches and Bateaux Parisiens are a popular tourist attraction in Paris so we recommend booking online in advance. 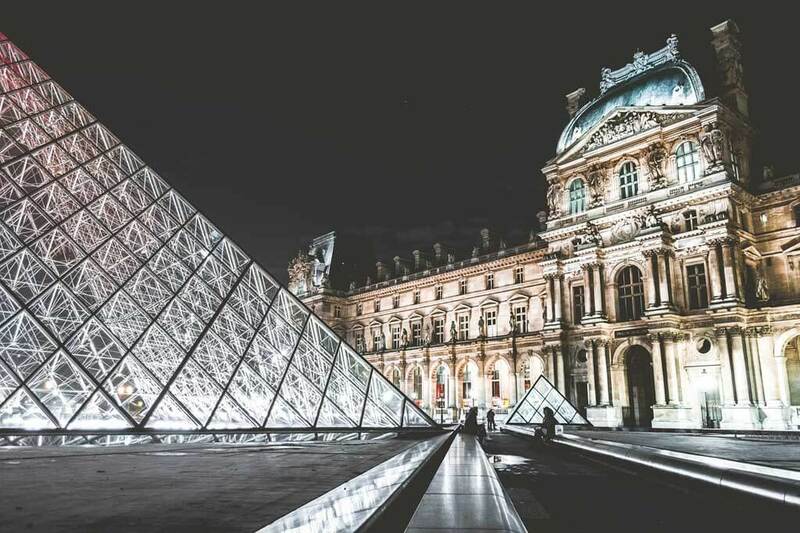 One of the most spectacular places to visit in Paris at night is the Louvre Palace and Museum, with its glowing glass pyramid dominating Cour Napoléon. Visiting the Louvre Museum at night is also a good idea because it tends to be less crowded than during the day. Also, Louvre artwork, especially the sculptures, look incredibly beautiful under the light of the moon. The Louvre Museum is open at night on Wednesday and Friday only, from 9 am to 9.45 pm. Some people still think that Parisian Cabarets are old-stylish but cabarets in Paris are a fun and entertaining part of Paris Nightlife. Cabaret shows usually include crazy can-can girls (our favorite part) but also singing, dancing and juggling. Most of the cabarets also come with the dinner option or a glass of champagne so you are covered for the full night. From Moulin Rouge or Lido to Paradis Latin Cabaret Show, we tell you about the best cabarets in Paris in our Paris Cabarets Guide. A night at the Opéra Garnier Paris, with the right program, is a great way to start a night out in Paris. We suggest arriving well in advance to admire its architecture and rich decoration. Feeling thirsty during the interlude? 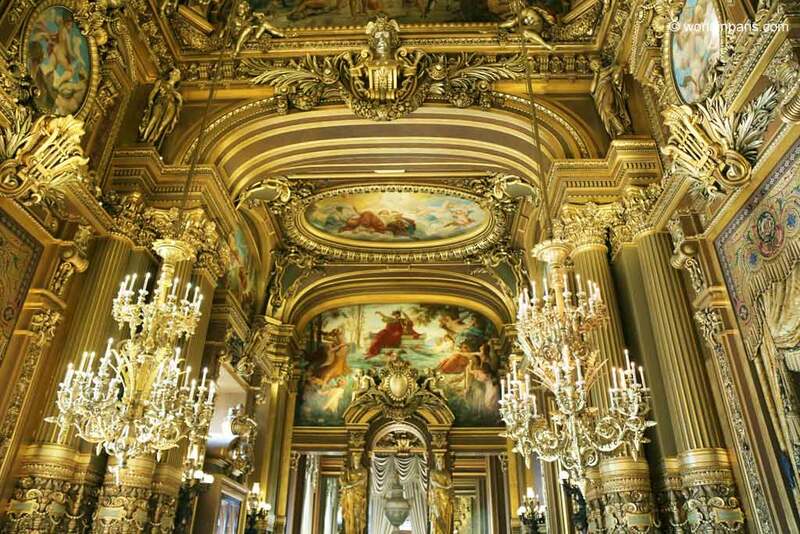 Then head to the Grand Foyer, grab a glass of champagne and admire this stunning gallery inspired in Versailles Palace. Book your opera tickets well in advance. OUR TIPS: If opera or ballet is not your thing but you don’t want to miss one of the most beautiful sights in Paris, we recommend Opéra de Paris night tour. Learn about Palais Garnier’s history and his most famous guest, the phantom of the Opera and enter his reserved balcony, #5 (option not available during the day tours). When the weather in Paris is nice and the sun starts to set down, there are few better ways to enjoy the nightlife in Paris than from above, cocktail in hand gazing across the lights and landmarks that define the city. 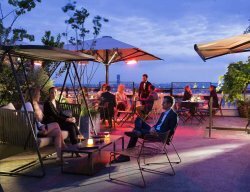 Check out our list of favorite rooftop bars in Paris, with something for every type. Want to finish your busy day in Paris with some laps? Head to the 5th Arrondissement of Paris, to the Art Déco-influenced Piscine Pontoise. Built in 1934, the unattractive external facade hides a listed building with a vintage touch, individual changing cabins, a huge glass ceiling, and mosaic frescoes. The pool is open until midnight from Monday to Friday and it’s difficult to find a more attractive setting for a late night swim. This is one of the most unique things to do in Paris at night. 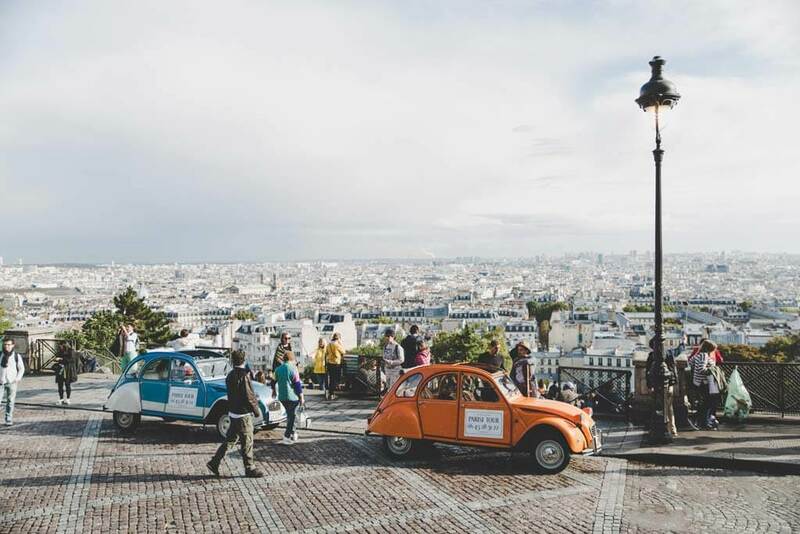 Drive in style through the city’s illuminated streets and avenues on a classic Vintage Citroën 2CV and get the most out of Paris after dark. Enjoy a bottle of Champagne while admiring Paris at night attractions beautifully lit up such as Arc de Triomphe, the Louvre, the Eiffel Tower, Notre Dame and Sacre Coeur in Montmartre neighborhood. 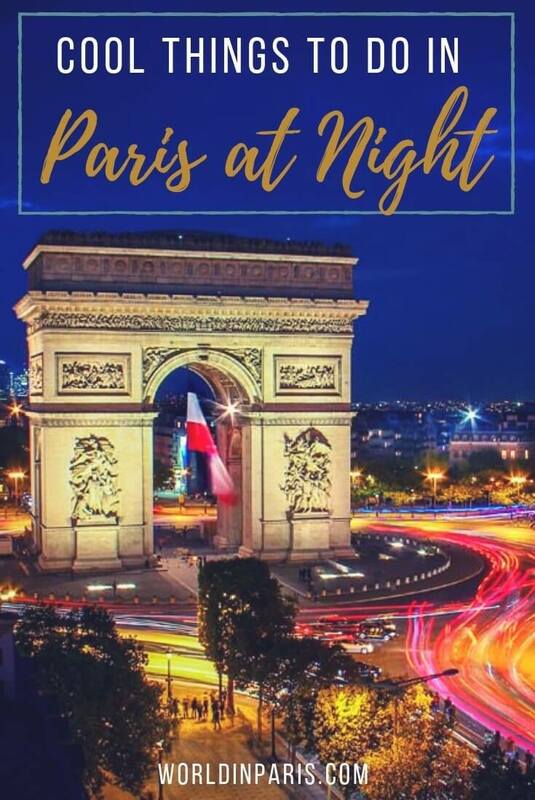 The tour includes a fun and informative driver /guide so you just need to sit in the back, relax and enjoy Paris by night. French cuisine sounds fancy but in the end, it’s all about quality – fresh products and creating a harmonious dish that elevates the quality of the main ingredient. That said, you don’t need to go to a Michelin starred restaurant to enjoy good local meals and you can eat most of the best French recipes in a nice brasserie or bistro. 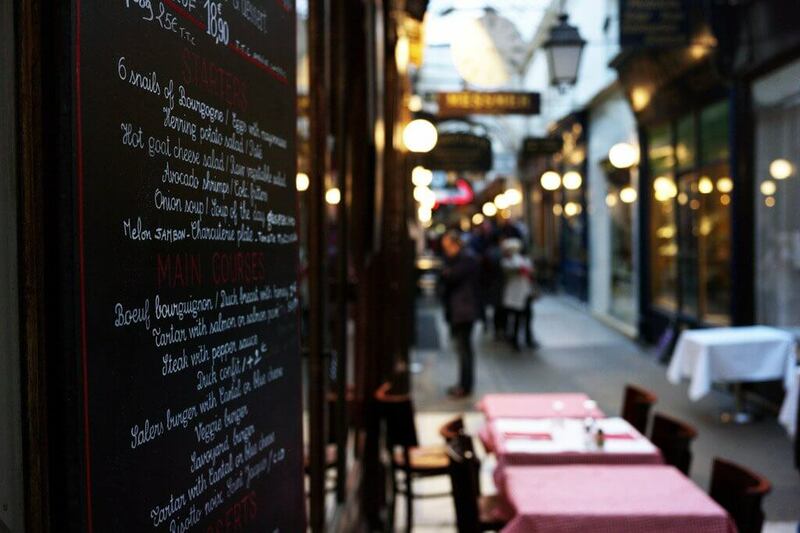 What to choose, a Brasserie or a Bistro? Both places serve typical French cuisine. A bistro is usually a pretty casual neighborhood restaurant, with a limited offer and specific opening hours for lunch and dinner while a brasserie serves throughout the day until late at night, and have a larger menu. Traditionally a bistro was a low key place but nowadays you can find also trendy or upscale bistros. 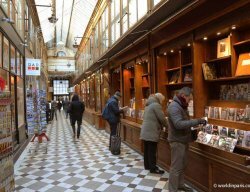 You can check some of our favorite addresses on Yummy Paris. Learn about the wine regions in France through a wine tasting and an informative master wine class. 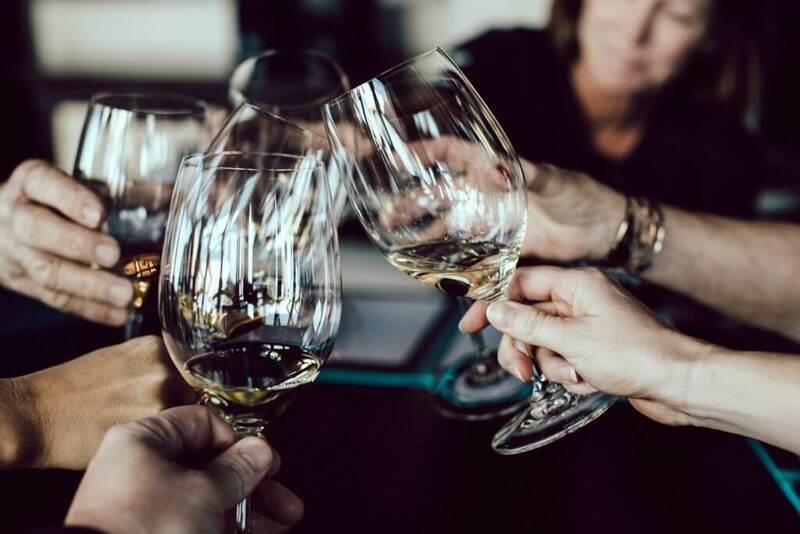 An expert sommelier will lead you through a tasting of exceptional wines, coming from different corners of the country, and selected to ensure a full and unique tasting experience. Usually, these tours come with a platter of cheese and charcuteries to complete the wine tasting experience. PRO TIP: If you know already that you won’t resist the temptation to buy some French vintages, think about wine packaging to transport your wine bottles safely back home! 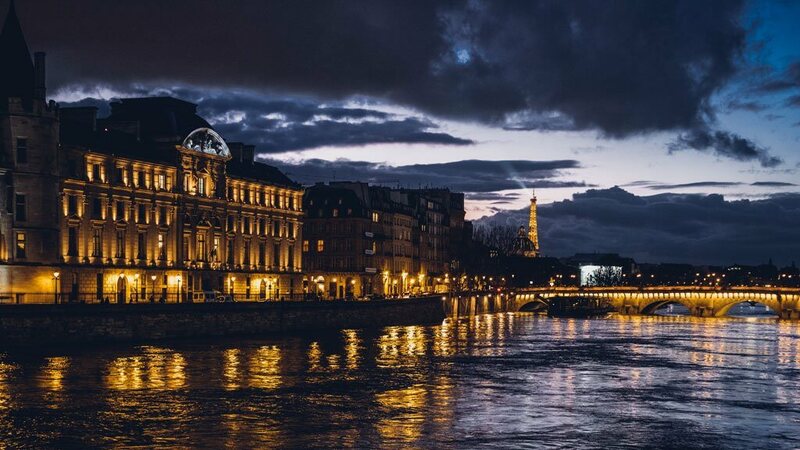 Paris is at night is a great experience for professional photographers or just photography aficionados. 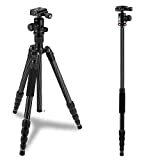 A guided Paris night tour with a professional photographer is always a good idea, especially if you want to improve your photography skills. 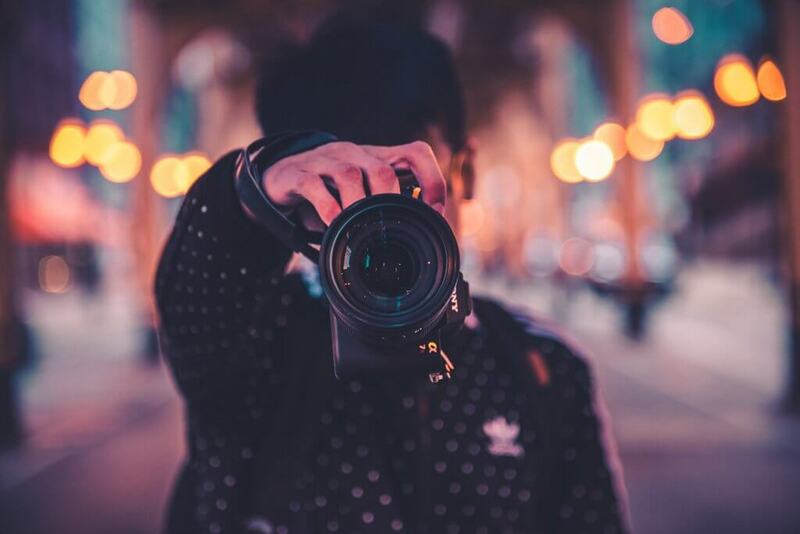 Apart from their invaluable photo tips, they know the best nightlife in Paris spots and how to get the most out of them so you can be sure to end the day with some great shots. 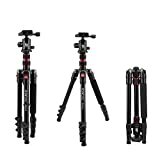 If you want to have more fun, remember to bring your own travel tripod, especially if you want to “play” with long exposures. This is a new Paris Tourist Pass especially design for those who want to get the most out of their Paris nights. This money saver pass includes a Parisian Cabaret, a ride on the famous Hop-on, Hop-off night bus and a Seine River Paris night cruise with Bateaux Parisiens. 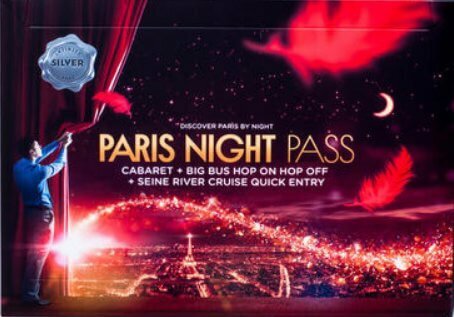 There are 3 kinds of Paris Night Pass, with different prices and options: Paris Night Pass Silver, Paris Night Pass Gold and Paris Night Pass Platinium. Want to know more about this great Paris Travel Pass? Click on the links above or check out our Paris Night Pass Review. We hope you liked our proposals to spend a night out in Paris. 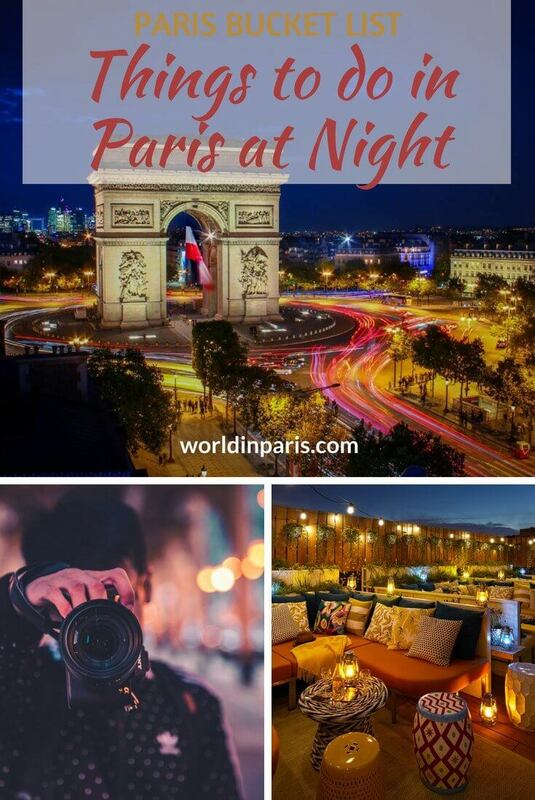 Do you know other fun things to do in Paris at night that we should include in this list? Your blog is just darling! I have done two Europe trips and shockingly never managed to fit Paris in (I think i’ve always heard mixed review- of either the best city in the world or those who haven’t taken to it). You really show the city from so many angles i definitely need to make the time to visit sooner rather than later. Great post! So lovely to see such nice nighttime photos!